APPSC Panchayat Secretaries Answer key 2019 to be released at psc.ap.gov.in: APPSC invited the Online applications from the eligible candidates for filling up the 1051 Panchayat Secretary posts between 27-12-2018 to 29-01-2019. All the desirous eligible candidates were applied for this recruitment stream and appeared the recruitment screening test on April 21. Who were appeared for this recruitment notification they are waiting for their Answer key of Panchayat Secretary Posts Recruitment 2019. Web Note: "The Andhra Pradesh Public Service Commission has conducted Screening Test (Objective Type) for recruitment to the post of Panchayat Secretary Grade-IV (Notification No.13/2018) on 21.04.2019 F.N. A total of 4,95,526 candidates have applied for the post and 3,89,014 candidates have downloaded their Hall Tickets, out of which 2,94,966 (75.82%) have appeared for the Screening Test held at 1320 venues across Andhra Pradesh. The examination was held peacefully all over the State." The PSC AP Commission would publish answer key soon on its website. Any objections with regard to the key and any other matter shall be filed with in one week of the publication of the key on the website of the Commission. The commission will provide chance for raising objections on the answer keys of this panchayat secretary examination. The objections if any would be examined and the decision of the Commission in this regard shall be final. Any objection filed after expiry of one week from the date of publication of key would not be entertained according to the APPSC Panchayat Secretary (Grade-IV) recruitment notification from the commission. Andhra Pradesh Public Service Commission (APPSC) released the answer key of the Screening Test which was conducted for filling up the Panchayat Secretary (Grade-IV) posts under Group-III Services on April 21 . The exam was conducted from 10 am to 12.30 am. The commission has published the answer keys in the official website. 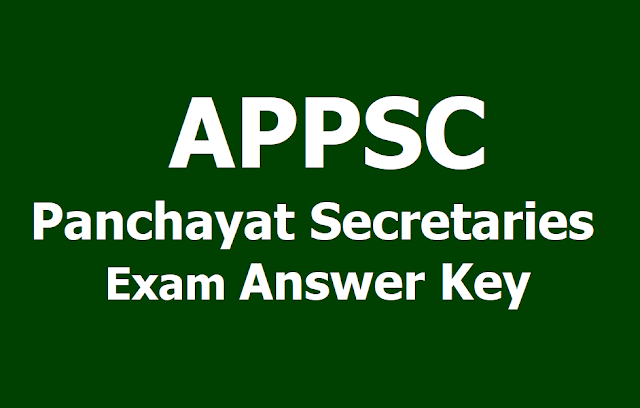 The keys for the Questions would be displayed on the website of APPSC (www.psc.ap.gov.in). The candidates may file their objections, if any, on the question papers/answer key. The objections would be received only in writing up to 7 days from the date of publication of key. Objections not supported by evidence would not be considered. The format for filing objections is available on the website of the Commission.